This is the 12th and last episode of "The Life and Times of $crooge McDuck". Both the end...and the beginning! This story happens at the same time than "Christmas on Bear Mountain" (OS 178), and so at Christmas 1947, first appearance of Scrooge in comic books! For those who know that story, "The Richest Duck in the World" happens between Scrooge tells James to tell his nephews that he's inviting them the day after (19th page), and the last page (20th page). The first redrawn panels in this story are not from a comic book but from a ...movie! For Charles Foster Kane, it is the end of the life... and the beginning of a new one for Scrooge! Hum... WELL !... Back to the comicbooks universe ! Don Rosa :"That last page I had planned all along, and as a full-page. How many full-page illustrations have ever appeared in a Disney comic? Barks did two that I recall, both in Dell giant comics. Any others...?" There is also a panel from Barks' "The Money Well" (W US 21), showing Fort Duckburg. You can find this panel at the Fort Duckburg page. 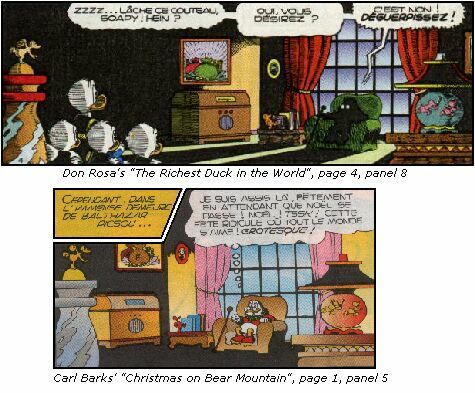 In the drawing "Scrooge's First Appearances", Don Rosa uses a panel from "Christmas on Bear Mountain". 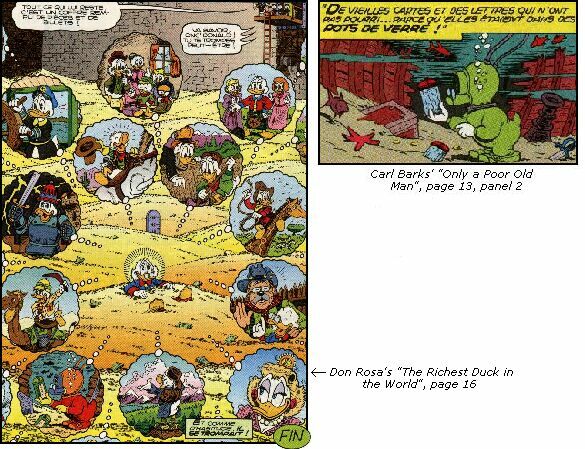 Other stories using panels from "The Money Well" are "His Majesty, McDuck" (AR 145), "The Guardians of the Lost Library" (D 92380), "The Invader of Fort Duckburg" (D 93227) (Fort Duckburg),"The Richest Duck in the World" (D 93488), and "W.H.A.D.A.L.O.T.T.A.J.A.R.G.O.N." (D 97052) (Fort Duckburg). Panels from "Tralla La" are also used in "Last Sled to Dawson" (AR 113),"Return to Xanadu" (D 90314), and "The Guardians of the Lost Library" (D 92380). Panels from "Only a Poor Old Man" are used in "Cash Flow" (AR 106), "Last Sled to Dawson" (AR 113), "The King Of The Copper Hill" (D 92083), "The Billionaire Of Dismal Downs" (D 93121), and "The Empire-Builder from Calisota" (D 93288).